More than 500 people are expected to rally and race Thursday evening in Downtown Chicago to raise money for organizations operating in the city’s neighborhoods most affected by gun violence. Families, community workers, civic leaders, law enforcement professionals as well as gun-violence survivors will gather at Upper Hutchinson Field in the southern end of Grant Park at 5:30 p.m. June 1st, running or walking to bring attention to this important issue. The city has already seen 947 shooting victims from Jan. 1 through May 2, with Austin topping the list with 130, according to the data compiled by the Chicago Tribune. This will be the fourth year that Strides For Peace, a non-profit organization aimed at ending Chicago’s notorious gun violence, hosts a race to bring awareness to deadly crime. 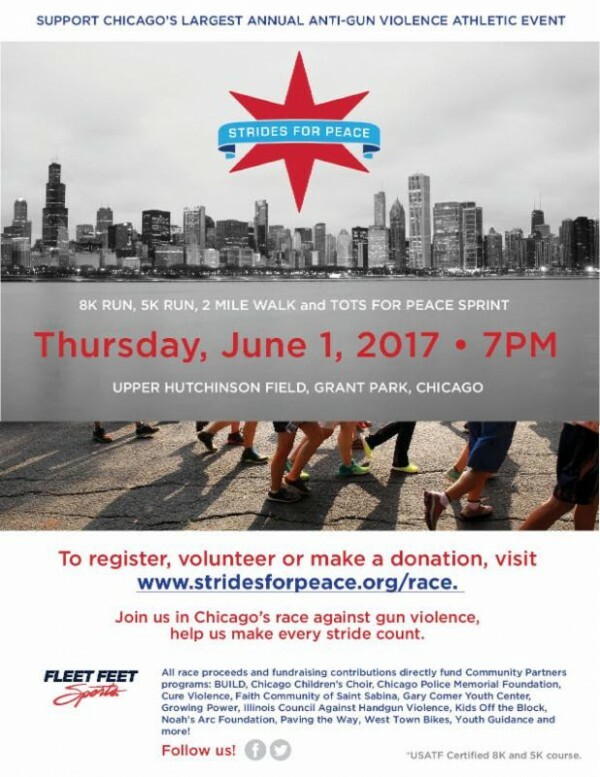 “Everything is different this year,” said Mary Stonor Saunders, the executive director of Strides For Peace, referring to the scale, timing and location of the race – all of which, she said, could better facilitate public understanding of and support for dealing with the long-term causes of gun violence. The last Race Against Gun Violence was hosted at Soldier Field in October 2016, attracting more than 800 participants. This year, the race was set on the eve of National Gun Violence Awareness Day and will help commemorate Hadiya Pendleton’s birthday June 2nd. The 15-year-old was shot to death on Chicago’s South Side in January 2013, one week after she performed at Obama’s second inauguration. As of Tuesday, about 550 people had registered; registration is still open here. All the net proceeds will go to 25 community agencies or programs that work to reduce gun violence, help shooting victims or educate youth. Most of them are based in Chicago’s South and West sides, places like Englewood and Austin, where shootings happen more frequently than other parts of the city. Last year, a total of 4,368 people were shot in Chicago – a 46 percent increase compared to 2015. Among them, 521 shooting victims were injured or killed in Austin – more than any other community in 2016, according to the Tribune. Deonna Hart, 38, a volunteer at BUILD, a group that works with youth in Austin and several other Chicago neighborhoods, plans to participate in Thursday’s event. She said it’s an opportunity to raise awareness and funding for reducing gun violence in Chicago’s most-affected communities. “Participating in the race shows the children part of Chicago that they didn’t know they have an access to before,” said Hart, who has worked for two years with West Side children who’ve been directly affected by gun violence and/or have relatives, classmates or acquaintances on their block who’ve been shooting victims. Hart said the reason young people carry or use a gun mostly comes from a sense of desperation. It is important, she said, to show them there are ways that they can legally and safely support themselves and their families. “This race helps them to see there are people who really care about bringing changes in their neighborhoods and want to see things get better,” she said. Saunders said gun violence has been a problem for far too long in Chicago; people have to understand the sense of urgency. State Sen. Kimberly Lightford, Riveredge Hospital and Delta Sigma Theta Sorority Inc. are sponsoring the April 8 event.